Ben Gastauer (Ag2r) took the biggest win of his career when he emerged as the strongest in the hilly first stage of the Tour du Haut Var. Having been part of a 5-rider breakaway, they strong Luxembourger attacked on the Mur de Montauroux to distance his companions and narrowly managed to hold off the peloton to take both the stage win and the first leader’s jersey in the race. 2014 was a breakthrough year for Ben Gastauer who had mostly been known as a loyal domestique when he lined up for the Tour de France. Those three weeks on French soil made him famous for his excellent climbing skills as he was the key support rider for Jean-Christophe Peraud and Romain Bardet and played a key role in securing Ag2r’s win in the teams classification. Until today, however, his only wins had come at the Luxembourg championships and he had never really been close to a big pro win. That all changed when he took a hugely impressive solo win on the first stage of the Tour du Haut Var. The opening leg of the two-day race was a typical Haut Var stage as it had several smaller climbs, very twisting and turning roads and a slightly uphill finish that was expected to suit the puncheurs. Knowing that a break would be hard to catch in this kind of terrain, Gastauer rode aggressively in the very fast start and he teamed up with Ignatas Konovalovas (Marseille), Thomas Vaoubourzeix (Veranclassic), Roy Curvers (Giant-Alpecin) and Loic Chetout (Cofidis) to form a strong break. The group never got a very big advantage as it hit a maximum of just 4.30 and with lots of teams participating in the chase, the move seemed to be doomed. After Chetout had been dropped, however, the escapees showed impressive strength to keep the peloton at bay and when they hit the brutally steep Mur de Montauroux with 15km to go, they were still 2 minutes ahead. Gastauer made use of his great climbing skills to launch an attack and with Konovalovas being his nearest chasers, he started a brave solo effort. He managed to distance his former companions who were all swallowed up but now the peloton had gone up to speed. The bunch managed to catch all the chasers but Gastauer proved to be too strong for the combined efforts of the many teams. He held off the 40-rider group by a few seconds and so it was only good enough for second when Jonathan Hivert (Bretagne) beat Philippe Gilbert (BMC) in the uphill sprint. With the win, Gastauer takes a narrow lead into tomorrow’s second and final stage of the race. At almost 200km, it is a long hard one with sever short, steep climbs. Finally, the riders will tackle the steep Cote de Tuilleres before they descend the 15km back to a flat finish in Draguignan, meaning that all is still to play for in the French race. The Tour du Haut-Var kicked off with a tricky 164.4km stage from Le Cannet des Maures to Seillans and as always in the 2-day race it was a day of ups and downs. With very few flat sections, the riders tackled four main climbs in the first part before they got to the exciting finale. With 15.5km to go, they hit the very steep Mur de Montauroux before they descended to a flat run-in to the finishing city. The final few kilometres were uphill though, setting the scene for a finish that suited the puncheurs. The race is known as the perfect preparation for the classics and it was real classics weather when they gathered for stage one. Rain was falling and the temperature was just 8 degrees when the headed out on the Var roads. As usual for this kind of hilly stage, the race got off to a very fast start with lots of attacks and it took a long time for the break to be established. Thomas Vaubourzeix (Veranclassic) was one of the most active but the peloton was still together when they hit the first climb after 20km of racing. Ben Gastauer (Ag2r), Ignatas Konovalovas (Marseille), Roy Curvers (Giant-Alpecin) and Loic Chetout (Cofidis) benefited from the ascent to get clear while a relentless Vaubourzeix took off in pursuit. With 124km to fo, the peloton had finally slowed down and the gap had gone out to 1.20 while the lone chaser was 20 seconds behind. After 50km of racing, Vaubourzeix made it across and at this point, the escapees had extended their advantage to 3.35. The fast pace meant that the riders covered 44km in the first hour. As it stopped raining, the gap went out to 4.20 when the escapees went into the final 100km of the race.In the peloton, BMC and Wallonie-Bruxelles had started to chase but with 72km to go, the gap was still 3.40. Chetout suffered an untimely puncture but he managed to rejoin the front group as several teams were now working in the peloton. FDJ, Europcar and Verandas Willems had now also come to the fore but on the twisting roads it was hard to organize a real chase. The escapees even managed to increase their advantage to 3.40 when they entered the final 50km of the stage. A little later, Konovalovas beat Vaubourzeix, Curvers, Gastauer and Chetout in the first KOM sprint. Bretagne had now hit the front and their work started to pay off. With 33km to go, the gap was down to 2.30 and now Chetout was dropped from the breakaway. The Cofidis rider fell back to the peloton while the four escapees were working excellent together and they hit the Mur de Montauroux with an advantage of 2 minutes. In the peloton, it was now FDJ doing the work while Rudy Molard (Cofidis) got back after a crash. Gastauer launched a big attack on the steep climb but Konovalovas managed to respond. Soon after, however, the Lithuanian cracked and with 12km to go, the Luxembourger was 45 second ahead of his main chaser, 10 seconds ahead of Curvers and Vaubourzeix and 1.20 ahead of the peloton. 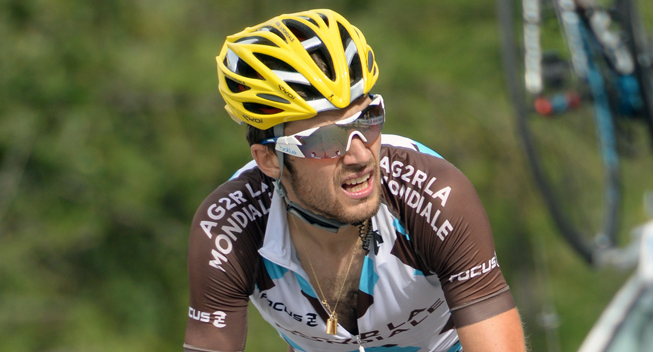 Gastauer led Konovalovas, Vaubourzeix, Cuvers over the top while Alexis Vuillermoz (Ag2r) was first from the peloton, meaning that Konovalovas took the first mountains jersey. The peloton was down now down to 40 riders but they were losing ground to Gastauer who was now 8 seconds ahead of Konovalovas and 22 seconds ahead of the next two riders. With 5km to go Gastauer were 21 and 45 seconds ahead of the two chasing groups respectively while the peloton had brought their deficit down to just 1.10. However, the main group was now at full speed and with 2km to go, all the chasers had been brought back. Gastauer entered the final kilometre with an advantage of 35 seconds and he narrowly managed to hold off the peloton, with Hivert beating Gilbert in the uphill sprint a few seconds later.